Screen sharing allows you to remotely view and control the screen of another computer. You can allow the end user to see the screen sharing session, or you can hide the screen sharing session so that the user is not interrupted. Jamf Remote creates an SSH connection to the target computer. Jamf Remote checks the target computer for the most current version of the jamf binary. If the jamf binary is out of date or missing, Jamf Remote installs the most current version over SCP or HTTP, depending on the way the Jamf Remote preferences are configured. If the file does not exist or contains incorrect information, Jamf Remote automatically creates or overwrites the file. The jamf binary checks if the Jamf Pro user who initiated the screen sharing session has the "Screen Share with Remote Computers" and "Screen Share with Remote Computers without Asking" privilege. If the Jamf Pro user does not have the "Screen Share with Remote Computers without Asking" privilege, the end user is prompted to allow the screen sharing session to take place. Jamf Pro logs the connection. 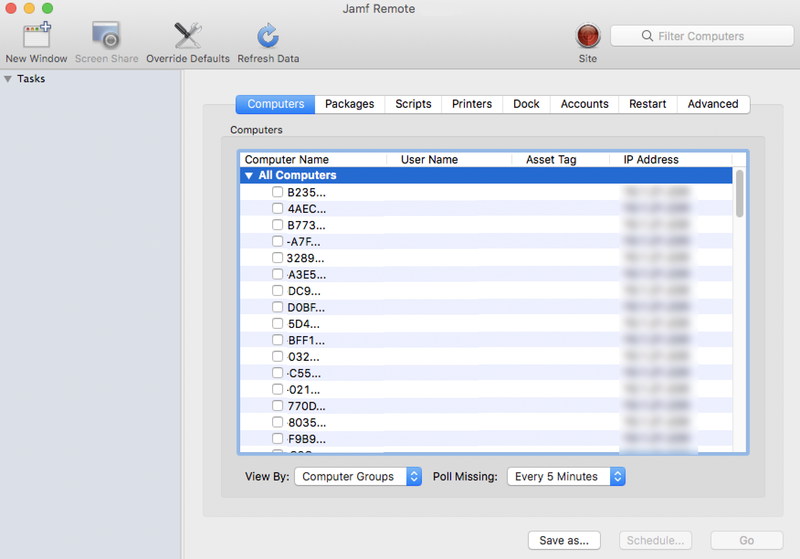 On the target computer, Jamf Remote starts the Screen Sharing service that is built into macOS. On the target computer, Jamf Remote creates a temporary account with limited privileges and uses it for the screen sharing session. When the Screen Sharing window is closed, Jamf Remote deletes the temporary account, stops the Screen Sharing service, and logs out of the SSH connection. If the SSH connection is terminated unexpectedly, a launch daemon deletes the temporary account and stops the Screen Sharing service within 60 seconds of the SSH connection being terminated. To share the screen of another computer, SSH (Remote Login) must be enabled on the target computer. In addition, if the target computer has macOS 10.10 or later, Screen Sharing must also be enabled on the computer. In the list of computers, select the computer that you want to screen share with. To allow the end user to see the screen sharing session, choose "Share Display" (macOS 10.8 or later) or "Ask to share the display" (macOS 10.7). To hide the screen sharing session, choose "Log In" (macOS 10.8 or later) or "Connect to a virtual display" (macOS 10.7). If you do not have the “Screen Share Remote Computers Without Asking” privilege, the end user is prompted to allow the screen sharing session to take place.